I went with a B. Despite my loving all the Narn and Centauri stuff in this episode, the rather bland other plot of the probe only interested me via Franklin's meltdown. I like that we get to see Ta'Lon again. Londo trying to distance Vir to keep him safe from the darkness Londo is finding himself in is endearing adding a nice shade of grey to Londo's character considering that Londo just got done earlier telling Vir that the Centauri can't just defeat the Narn but have to break them after Londo's questioning of Na'Far regarding work camps and executions on the Narn homeworld. But ultimately for me, this episode rests on G'Kar. His struggles as the only remaining member of the Narn leaders still capable of doing anything for his people is the most important part of this episode for me. I gave it a C because of the probe thing. I think the ep would have been better without it. I also agree that the probe plot was OK but not great. Still, a C for B5 is probably a B for most any other series. The major problem with the probe was the manner in which it was finished. Sheridan -- on a hunch -- decides in a last-second decision not to send the answers. Okay, I would believe Garibaldi to do something like that on such an uncertain, primal feeling, but Sheridan? Captain Sheridan is responsible for the 250,000 people on Babylon 5. Why did those lives matter so much in "Severed Dreams" as Sheridan put the station at risk, but not here facing an even greater risk? It is not because there was not enough time to mention them, but it was because it is obvious to any audience with half a brain built that the probe would have no significant consequences to the lives on Babylon 5 we were supposed to ignore. The more that I think about it, the more the premise behind this probe seems like a ridiculous idea. 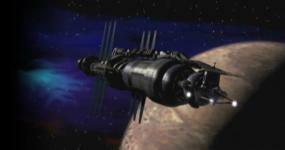 Furthermore, why did Babylon 5 not order an evactuation? Did the alien probe place a stipulation on transports leaving the station? Come on team, at least discuss possible tactical solutions (e.g. knock out the probe's sensors with, say an E-M pulse, thus allowing you to power your weapons; strap a MaintenanceBot with a fusion bomb onto a collision course, etc.). Offensive strategy deserves at least a mention in the script. The alien probe was such a poor plot line, because it was not given the dramatic attention that it required as well as the poor characterization displayed by Sheridan's call not to send the probe the information. The encounter with the probe removes all hope of redemption when our heroes fail to even attempt to wonder who sent it. No expeditions, no calls back home, no questions unsolved, no lasting ramifications -- just the probe's take-off. Is scheduling the Transport Association meeting AFTER the explosion time of the probe supposed to be that funny? To my knowledge, the Transport Association does not even receive another mention for the rest of the season. MOTHER! This probe just screws everything. The Narn story is good, and the Londo/Vir good-bye was done superbly, but these two factors cannot save this episode from its fate. As for Franklin's druggie story. . . umm . . . it never really seemed characteristic of him from the get-go. Dr. Franklin has all this history of genius, (Harvard medicine!) and moral fiber (bio. notes in E-M war) that it seemed unlikely for him to become victim to drugs in the first place. Oh, I know, it happens with doctors, but from a strict writing standpoint, Franklin needed to undergo some form of personal tragedy before sinking into the level of drugs. The way it was handled it just seemed like it was written just so Franklin could have something to do. This is the episode where JMS could have turned it over to Harlan Ellison, Lawrence DiTillio, Scott Frost, Peter David, or someone to see what angle they had on this story. I mean, even though "Exogenesis" was worse, it at least resembled JMS-esque themes. In the final analysis, "A Day in the Strife" represents the second worst episode of this bright season. Like Montoya to Lennier, I am giving this one a failing grade. I don't have time to argue with you about the probe right now, but I think you are way off base with the Franklin drug thing. It is because he is so strong, and driven to do his job, that he comes to rely on stims, not for escape, or pleasure, but to keep him going to do his job. Further, being a Dr., he thinks he has the knowledge to handle them, and not go to extremes, but he was wrong. It makes perfect sense to me. I agree with Jade Jaguar in the matter of stims and Franklin. Presumably the technology has improved in a few hundred years and even now there are drugs that can take you from 36 hours without sleep to feeling rested, alert and ready to go... *not* hyper or strung out. Yeah, if Frankin had gotten hooked on some kind of pleasure drug it would have been uncharacteristic but the stims were practically tailor-made for his personality. As for the probe, I think the whole point was to demonstrate Sheridan's analytical and stretegic abilities, nothing more. Enlightened_G'Kar has some valid points except for completley ignoring that few of those suggestions would fit in the one hour (approx 43 minuts, I think) format. As for the probe, I think the whole point was to demonstrate Sheridan's analytical and stretegic abilities, nothing more. And Garibaldi also makes a point of this during the episode. Back to the episode ratings, I give it a C, because its not a poor episode, but it is a bit dull. Good to see Ta'Lon back with his nifty sword. I think they gave the character a sword because Marshall Teague is a nut about swords, and he was allowed to get the sword designed to his own specifications. As for the Beserker, I don't think Sheridan jumped to the decision at the last minute, he was probably mulling over it for the course of the episode. But yeah, the probe storyline wasn't that strong, and if it couldn't have been though out better, it shouldn't really have been used. As for the stims, they are perfectly legal in the B5 universe, so Franklin wasn't being irresponsible taking them every now and then. Franklin didn't need a personal tragedy to begin to abuse himself (although as we find out later with the walkabout, he had a lot or personal issues bubbling under). He probably used them for most of his life in a perfectly safe manner, but when work got on top of him (I think Confessions and Lamentations is when he really starts using them a lot; remember the Markab doctor telling him that too many stims weren't good for him, but Franklin was in a position where he really didn't have much choice) he started using them more and more. And Franklin seemd to be in denial about a lot of things to do with his personal life, so this was just another thing he added to the list. It was just something he had to sort out for himself.
. . . I think you are way off base with the Franklin drug thing. It is because he is so strong, and driven to do his job, that he comes to rely on stims, not for escape, or pleasure, but to keep him going to do his job. Further, being a Dr., he thinks he has the knowledge to handle them, and not go to extremes, but he was wrong. It makes perfect sense to me. It does make perfect sense. I never said it was implausible, or shocking, or too difficult to believe that Franklin got hooked on drugs, but I did say it could have been handled better. This is fiction; think of the possibilities. Also, I never implied that Franklin came to rely on them for hedonistic pleasures, but what I meant to convey is that the stims did not have the proper origins in Franklin's life to be dramatically effective. It could have been so much more powerful to have a valid and strong reason why our hero Franklin became so dependent on drugs. The way it was done, it was done okay, but this story had the potential to be done phenomenally. If Franklin's drug addiction had appropriately warranted, then you are looking at a much better story. Captain Sheridan is responsible for the 250,000 people on Babylon 5. Why did those lives matter so much in "Severed Dreams" as Sheridan put the station at risk, but not here facing an even greater risk? I don't understand this comment. It is certainly because he cared about the lives on board the station that he didn't send the probe. And it's perfectly in tune with his personality. Remember that before the Earth/Minbari war, Sheridan's life and career were unremarkable. He made a name for himself when facing the destruction of his ship at the hands of a Minbari battleship. Sheridan becomes some sort of military and strategic genius when the pressure is greatest (possibly the character is named after Civil War general Philip Sheridan?). It's not as if he said, "Hey, you know what would be funny, if we didn't send the info, lol rotflmao!!" He thought it through and concluded that not sending it was correct. It would have been more risky to actually send it. The "valid and strong reason" for Franklin's addiction is that he fell into the trap of routine and self-denial. The choice of drug was due to his OCD work ethic but both the draw towards addiction and the over-working come from the same loss of spirit, which is as tragic as any of the grand operatic drama things. Sheridan and Ivanova are our opera characters, Garibaldi and Franklin are our regular guys, and it's a good balance.